Certification grants confirmation of certain characteristics of an organisation, often but not always, provided by some form of external review or assessment. 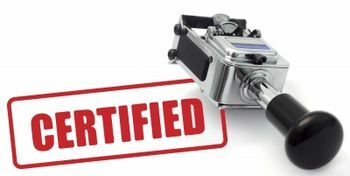 Third party certification through trusted associations and institutions provides customers with the assurance that their suppliers adhere to the strictest standards of quality. To this end, REO’s IBK drives division in Kyritz, Germany was recently certificated according to DIN ISO 9001:2008 and is named as a company with an exemplary organisation.REO always sets highest requirements to quality and cross-national standards for products, manufacturing, and distribution. The compliance of quality factors in the ISO certification is a matter of course for REO. REO also actively pursues certification in specific industries, like its train technologies division in Hennigsdorf, Berlin which is now certified to the International Railway Industry Standard (IRIS). TÜV SÜD Management Service GmbH has confirmed as an IRIS-approved certification body that REO’s Management System has been assessed and found to be in accordance with the International Railway Industry Standard Revision 02, May 2009, for the design and production of inductive components, electrical components and high power filters. The main focus of the train technologies division in Berlin is on development and sales of transportation converter solutions. Development work is carried out for international manufacturing in America, China, India and Germany. The Centre of Competence is affiliated to a strategic global purchasing department for the area of railway engineering. Much of REO’s business is with OEMs and the company operates three distinct levels of UL certification that can be applied when manufacturing and supplying products and components in order to satisfy customers’ export requirements, either directly into these markets or through OEMs.